This website is dedicated to the late 70's through early 80's Mattel toy line... the Shogun Warriors! Unfortunately, I was too old (aka too "adult"... I was in High School and too "cool") to play with Shogun Warriors when they came out in the late 70s, but I remember vividly thinking that the fist-firing Godzilla was way too cool and secretly coveted one. When I got older and wiser, I decided to start picking them up (this was all started by my girlfriend finding a Shogun Godzilla at a yard-sale for $3!). Fortunately they are still reasonable to collect (well, I guess these days that's a relative claim). Until 2016 a sub-set of these pages were offered on my Wildtoys.com website - in 2016 I moved the pages with new updates and image to its own domain - shogunwarriors.org. For the most recent additions please refer to the Shogun Warrior section of my What's New Page and read my blog posts. In 1977 Mattel licensed from Popy Toy of Japan (a Bandai subsidiary) several popular toys to be known as Shogun Warriors in the US. These were actually Super-Hero (aka Sentai) or Giant Robot (aka Jumbo Machinder) toys from manga and anime released in Japan in the early 70's by Popy. The Shogun warriors were billed as "Invincible Guardians of World Freedom!" and were in fact giant robots that had their own series, either in manga form (the Japanese version of our comic books), or as anime (Japanese cartoons) on TV or in movies (very much part of Japan's popular modern culture). For more info on Shogun Warrior origins and the creator of human-driven giant robos (and probably the spiritual creator of what we think of as Shogun Warriors), Go Nagai, go here. Probably the most recognized of the Shogun Warrior and certainly the most representative of the US releases are the giant vinyl figures known as Jumbo Machinders. The Mattel releases included: Daimos, Dragun, Gaiking, Godzilla, Mazinga, Raydeen, and Rodan. Grendizer was added in Europe as Goldorak and further variations to packaging and figures followed. Mattel released several different sizes of the smaller metal Shogun Warriors known as Chogokin in Japan. These smaller Shoguns are collected by both robot toy collectors and people who collect Japanese die-cast toys. These came in various sizes/price points and are loosly grouped as follows: 5 1/2 to 6" Two-in-Ones which transformed or had 2 different functions; Five-inch Action figures which came with various weapons and accessories; Collector's Shogun Warriors which were three to four inches in height and packaged in window boxes; and lastly a group of vehicles often referred to as Popynica, many of which came with firing parts/missiles or small figures. There were six different 5 1/2" Two-in-One figures which were much like (and the predecessors of) the Transformers line that came out years later. These were Danguard, Daimos, Gaiking, Grandizer, Raydeen and Voltez V. Both because of their sophistication (making them more desirable) and because they came out toward the end of the toy line, these figures are extremely hard to find in original packaging and command much higher prices. There were four different diecast 5" Shogun Warrior action figures: Dragun, Mazinga, Poseidon and Raider. Due to cost-cutting measures implemented by Mattel during the 70's, there exists two or three versions of each figure, each new version further simplifying the figure that came out before it (i.e. fewer weapons, features, fists and weapons becoming non-firing, missiles becoming "safer" and less general "play-ability"). 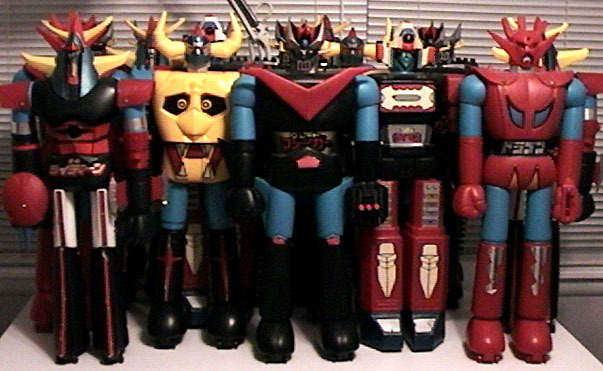 There were 10 different Collectors Shogun Warriors: Combatra, Dragun, Gaiking, Grandizer, Great Mazinga, Poseidon, Dangard, Leopaldon, Voltes V and 17 (Daitetsujin 17 in Japan). These colorful die-cast shoguns featured metal bodies with plastic heads and limbs. Their only moving parts were the arms and hip joints. I've placed the many Mattel licensed items and catalog ads in this portion of the Shogun Warrior segment. You'll find some odd-ball stuff here, much that you've probably never seen. I've also placed images of Japanese and European figures and accessories here.